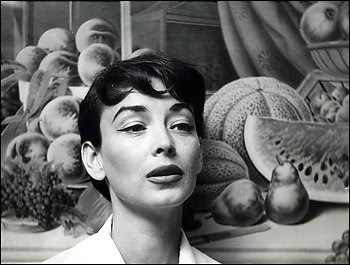 It is becoming an annus horribilis for fashion... Dorian Leigh, one of the legends of fashion, died last week aged 91 in Falls Church, Virginia, USA. Her incredible beauty, with her brunette curled hair, her near perfect face, with blue eyes and almost always red lips, exuding class and style and her impeccably poised body helped her to forge an inimitable path through life, not only in modelling but in everything she put her hands into. Born in San Antonio, Texas, in 1917, she was raised in New York, her father becoming rich by developing an etching acid. She attended Randolph-Macon Woman’s College in Lynchburg, Virginia, and then NYU, where she studied calculus; that got her a job working for the US Navy as a mechanical draughtswoman. She then went on to Eastern Aircraft Corporation, helping to design aircraft wings. She discovered that the job strained her eyes: leaving Eastern, she then took a job with Republic Pictures as an apprentice copywriter. Her modelling career began at the relatively late age of 27. She signed up at the Harry Conover Agency; the owner advised her to go immediately to Harper's Bazaar and tell the editor, Diana Vreeland, that she was only 19. 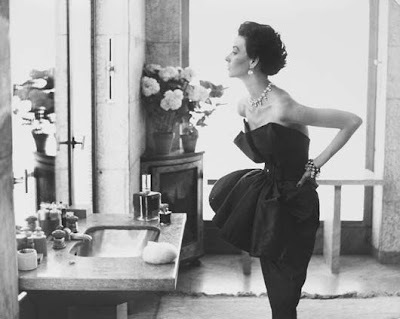 Vreeland was captivated and instructed her never to touch her zig-zag eyebrows. I do not know if she ever believed the age thing - Dorian surely must have looked like a diva from early on. 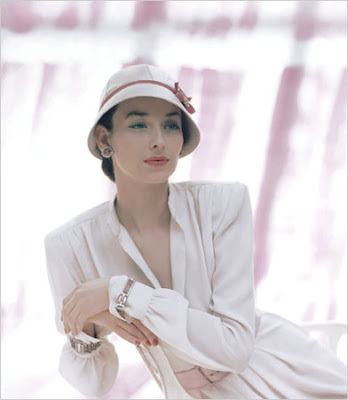 Nevertheless, the next day Dorian was photographed by Louise Dahl-Wolfe wearing a black tulle hat trimmed with a pink rose. She appeared on the cover of the June 1944 edition of Harper's Bazaar and the rest is history. Her father did not approve of modelling (what father did back then? )and insisted that she drop the name Parker. 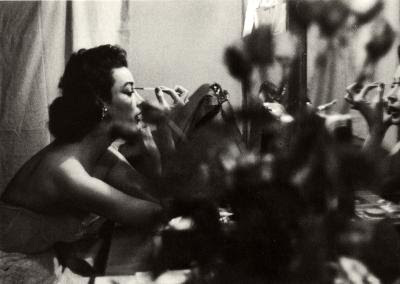 That is why she became famous as Dorian Leigh. 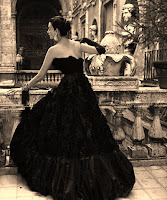 Seven Vogue and more than 50 other magazine covers show how loved she was by photographers and stylists and designers. Back then, throughout the 40s and 50s, there were runway models and photography models: a model either did one or the other. 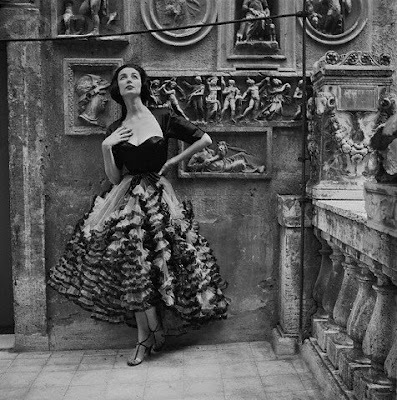 Dorian was a photography model, her 5-feet 5-inch frame more than suitable for the exquisite couture of those years (just say the names out loud: Dior, Balenciaga, Fath, Patou, Chanel, James... makes me drool just thinking about them), resulting in great photographs. 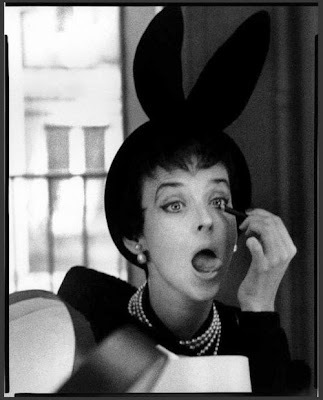 She was a muse for Avedon, Horst, Penn and Beaton (history of photography anyone?) . In the 50s, she was the signature Revlon Fire And Ice girl, promoting in every company ad the Fire and Ice colours, almost becoming synonymous with the brand. 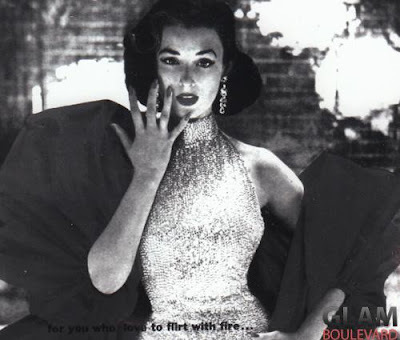 "For you who love to flirt with fire; who dare to skate on thin ice" was the slogan, with Avedon shooting the photographs. The famous Fire And Ice Revlon ad - Mattel even made a Barbie dressed like her! 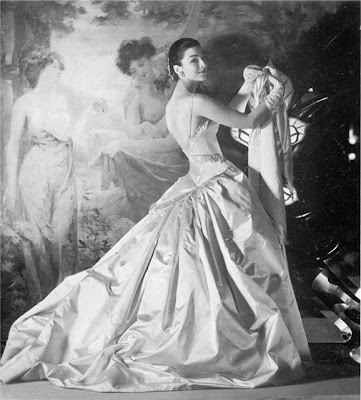 In his Photobiography book, published in 1951, Cecil Beaton writes that Dorian Leigh could convey "the sweetness of an 18th-century pastel, the allure of a Sargent portrait, or the poignancy of some unfortunate woman who sat for Modigliani". 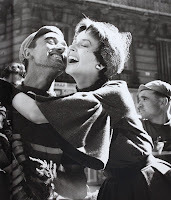 Richard Avedon said that she was the most versatile model, and the loveliest, that he had ever worked with. 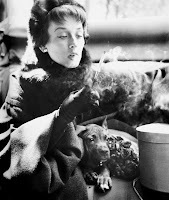 Truman Capote called her "Happy-Go-Lucky", and it is said (though many notable women claim the distinction) that she provided him with the character of Holly Golightly for "Breakfast At Tiffany's". 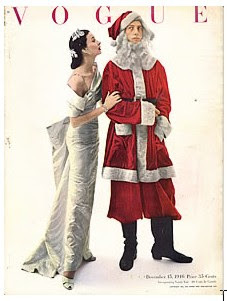 Vogue USA December 1949 cover by Irving Penn - inspired by fairy tales. Ray Bolger is Santa. Her career lasted until the 60s, her younger sister Suzy Parker becoming her natural successor (Suzy also became a legendary model, even more than her sister). Then, Dorian Elisabeth Leigh Parker moved to Paris and opened a modelling agency, one of the first in Europe (it closed in 1972 because her then husband embezzled the money). She then retired from the fashion world and decided to occupy herself with another one of her loves: cooking. Coat by Dior, Paris, August 1949 Richard Avedon. She opened a restaurant, Chez Dorian, near Fontainebleau and ran it for two years. At the same time she was teaching at the Paris American Academy and La Varenne cooking school. She moved back to New York in the late 1970s, intending to take over a modelling agency, but instead ended up creating and selling food through her catering business. She catered in the Washington area in 1988 with a business she called Fête Accomplis and returned to Paris in 1999. After a diagnosis of a brain tumour, she moved to Falls Church in 2005. In addition to her autobiography, "The Girl Who had Everything" (Doubleday, 1980), she also wrote "Pancakes: From Flapjacks to Crepes" (1988) and "Doughnuts: Over Three Dozen Crullers, Fritters and Other Treats" (1994). She married five times and is survived by her daughter Ms. Paciello, from her second marriage to Roger Mehle, a son from her first marriage, T. L. Hawkins; and a daughter from her marriage to Serge Bordat, Miranda Bordat; three grandchildren; and two step-grandchildren. A daughter from her marriage to Hawkins, Marsha Lynn Smith, died in the early 1990s. A son, Kim Blas Parker, from her liaison with the Spanish racing-car driver and athlete Alfonso Cabeza de Vaca, marquis of Portago, committed suicide in 1977 at 21. @ α, μπα? : Δεν ήταν αυτή η πρόθεσή μου (η πατσαβουρίαση δηλαδή). Αλλά χαίρομαι που δροσίζεστε τουλάχιστον (αν και το προηγούμενο ποστ νομίζω ήταν δροσιστικότερο!). Γεια σου αστερι μου. Μπραβο και απο εδώ. Νασαι παντα δυνατός και δημιουργικός. Αυτό ναναι το όπλο σου, η ξιφολόγχη σου. Α, καλε πέρασε και η Μενιεκ από δω ; α, το κορίτσι μας το εις διακοπάς ευρισκόμενο ! ευχαριστω πολυ… καλα που θυμήθηκες το flexi? Α μάνα και γιός στη σειρά, υπέροχα! @dinosma: Καλώς ήρθες και από εδώ! Είδες τι θυμάται κανείς? Το Girls On Film πάντα μου θυμίζει εκείνο το flexi! Μου άρεσε πολύ αυτό το αφιέρωμα.. και τι καταπληκτικές φωτογραφίες ειδικά αυτή η άσπρη με το καπέλλο! Penelope χαίρομαι που σου άρεσε! I knew her when she lived in Fredericksburg, VA. She was a feminist and a strong Democrat. I loved to hear her stories. No one really knew who she was -- and her stories seemed so over the top -- but given her amazing life, I had no doubt that they were true.